Model: Elandria, a stock model on Deviant Art. 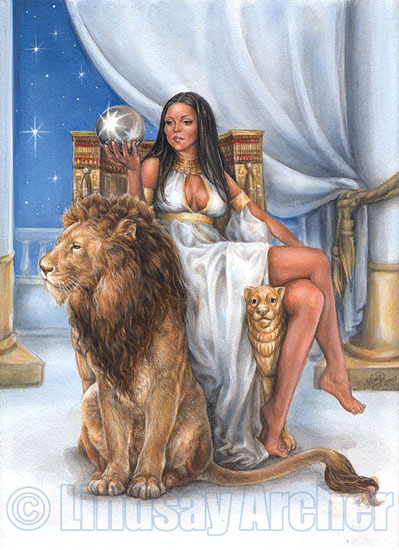 A queen sits on her throne, her pet lion at her foot. She is the ruler of all she surveys. Her powerful presence is awe inspiring and alluring. 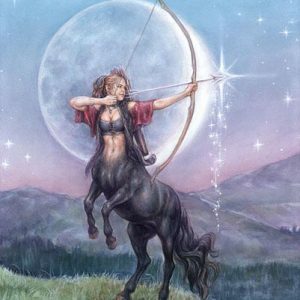 This painting represents the Zodiac sign Leo for the series of paintings known as the Celestial Series. The stars tie the painting into the Celestial theme carried through the series of paintings. Kind and helpful. The Leo easily shows love and affection on people. Energetic. Ruled by the Sun, this sign has tons of energy. Optimistic. The glass is half-full and that’s it. Straightforward. Honesty is something the Leo is familiar with. Loyal. And they demand the same in return. Headstrong. It takes a lot of convincing to change their mind. Egotistic. Actually, their ego is so big that it stumbles them in their path to success. Dominating. Because he/she is the King of the Jungle,remember? Impatient. I want it all and I want it now! Arrogant. Self-centered. Because this is how a king should behave!